iPhone in Japan …in English ! 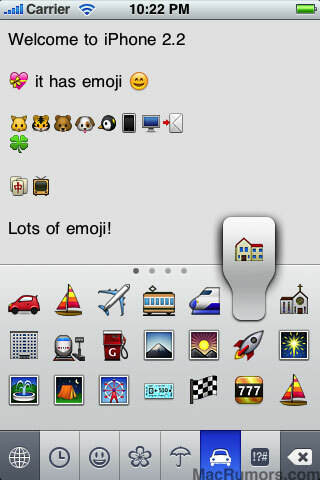 Emoji coming with iPhone 2.2 firmware update? According to MacRumors, the latest iPhone 2.2 firmware, just seeded to developpers, contains 461 emoji characters. It is unclear if these will be made available on this firmware release or for a following one. It is also yet unknown if Softbank participated in the creation process, allowing the iPhone not only to send, but also receive emoji from other Japanese carriers on the i.softbank.jp e-mail address. Currently, sending emoji through the iPhone is only possible through a webapp. This entry was posted on Monday, October 6th, 2008 at 9:25 am and is filed under Apple, Softbank. You can follow any responses to this entry through the RSS 2.0 feed. You can leave a response, or trackback from your own site. 4 Responses to Emoji coming with iPhone 2.2 firmware update?